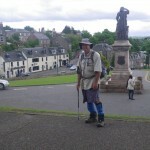 Our 300 Km walk from Glasgow to Inverness is finally over. The last day has been the longest and the least interesting of the trip, except for the last few kilometres through the city. We had to walk about a kilometre to get to the village of Drunmadrochit, where Felicity purchased some fresh rolls for lunch while I re-adjusted my boots to try and minimise the pain from the blisters I have on both heels. For a while the Way followed along the A82 highway, which wasn’t much fun because even though there was a footpath, large trucks and buses hurtling past at high speed next to us made us feel in a bit of danger. After a while the track left the road and continued further up the hill. We passed a memorial for John Cobb, who tried to break the water speed record on Loch Ness in 1952. He built a small boat with a jet engine strapped on the back, and managed to get it up to over 320 Km per hour down the loch. Unfortunately the world record demanded that he travel two measured miles and take the average speed, and on the way back the boat hit a wave and crashed spectacularly, killing him in the process. 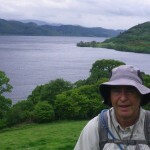 Later on we stopped and Felicity took a photo of me in front of the ruins of Urquhart castle, on the headland in the distance. This has been a fort since at least 562, when Saint Columba came and baptised the Pictish King Emchath. The original castle was built around 1229, and it changed hands regularly from then on, depending on who were the meanest and nastiest fighters in the Glen at any time. After this the Way led through a lot of rather boring forest, then across a moor, then through some more boring forest. About lunchtime we came to a series of advertisements for a cafe in the middle of nowhere, and Felicity proposed buying a cup of tea and asking to eat our own food but I thought this would be uncool so we passed by. We soon left the trees, and had to walk for miles past farmland down a long tarmac road with a chilly wind blowing in our faces. This was extremely tedious. Eventually we came to another forest area with a seat, and we sat down in relief to eat our lunch. 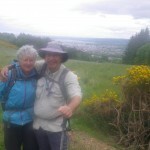 By this time we had been caught by Charles and Anne, who we have been walking with over the last few days. They ate their lunch too, and after that we continued with them till Inverness. The next part of the Way followed an old drover’s road which was somewhat attractive due to the stone walls at the side. It wasn’t too long before we could see Inverness in the distance, so we stopped to take a rather foggy photo. Walking through the town was quite pleasant, even though I had very sore feet by this time. We rejoined the Caledonian Canal briefly, except we were walking west towards Fort William which was a bit disconcerting. 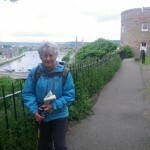 We crossed the canal on a swing bridge, then the river on numerous foot bridges, as the trail traversed several islands in the Ness. 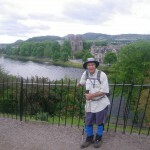 Eventually we arrived in the city, and climbed up to Inverness Castle where the Great Glen Way officially ends. A couple of Irish girls who had just biked from Fort William took our photo and our mission was complete. 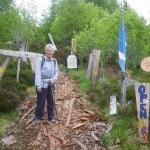 Congratulations, what a mammoth walk. Shame the last day was not so interesting and you had sore feet! Where too next? Enjoying hearing about your adventures. lots of love to you both. Congratulations! I like the last photo. I have really enjoyed reading your about your progress. 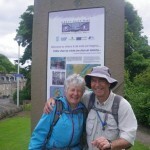 You both look so fresh and happy in your Inverness photograph. 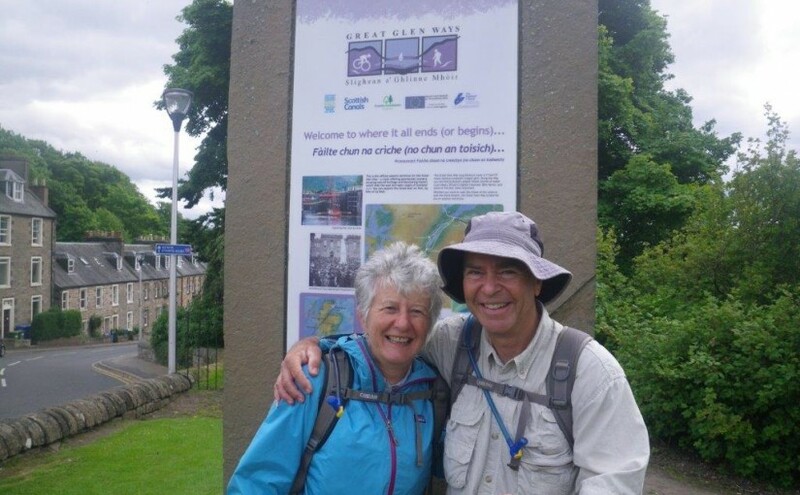 Who would have guessed that you two have just completed a 300km walk. Tremendous achievement, Sounds as if the last day was cruel, but clearly some great episodes and moments along the way. Looking forward to seeing you back in Oxford.